The myth that a plastic tank is a commodity and that they are all the same design, has finally been busted. With force. To be honest, we were sick and tired of people comparing our Ribbed Wall™ vertical storage tank with every other tank on the market. For years we have said that, you are not comparing apples with apples. We asked questions like, have you considered the strength of the side walls, have you considered the roof construction and do you really want to risk a cheaper option? Why did we design such an over-engineered Ribbed Wall™ Vertical Tank? The reason we over-engineered this tank was that we wanted to provide our customers with a premium product at an affordable price. When this Ribbed Wall™ Storage Tank was designed, it seemed that every other tank designed had failed at some stage as a result of a bad structure. This included roofs caving in and side walls cracking. We wanted to provide a better option than that. So we did. "Believe it or not, this Ribbed Wall™ vertical tank was designed by one of the founders of Enduraplas. A structural engineer that had an experienced background in the construction industry. In fact, he designed and engineered many commercial bridges. 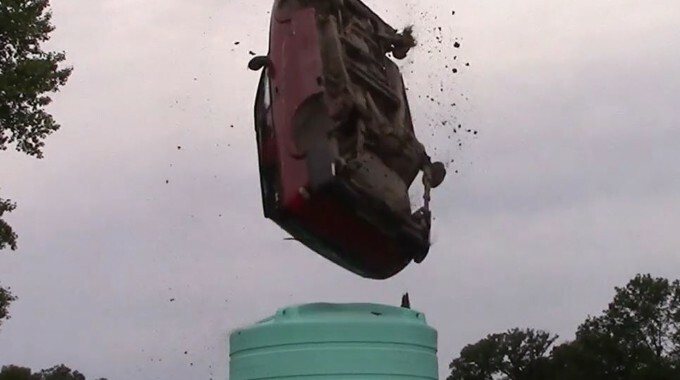 That is one reason why we knew this tank would easily hold a car:)"
How does our Ribbed Wall™ Vertical Tank manufacturing process set us apart? One thing I've always wanted to explain is some of the drastic measures we take to ensure that every ribbed wall vertical storage tank that leaves our manufacturing facilities is ready for use. Our manufacturing process truly sets us apart. All our tanks are rotationally molded. This process ensures that the thickness of the tank is considered as one of the most important features of its structure. The Ribbed Wall™ Vertical Tank is tested in many ways to ensure it is built to handle heavy, expensive liquids. Drop Test - One of the tests that is conducted is called the 'Drop Test'. This process first involves freezing a piece of the tank to a freezing 40 below. Once this piece of tank has been in the freezer for over 8 hours, it is then pulled out and put under the intense impact of a 18 pound pin. The time between the freezer and the impact is always under 5 seconds. If the tank cutout does not pass the tank, it will crack and shatter into several bits. Thickness Test - The next test in the process of manufacturing this tank is the thickness tank. This involves using a tool to investigate the thickness at every important area of the tank. The base, the middle and the top. This test ensures that the ribbed sidewalls are thick and strong enough to handle heavy liquids. Now that you know how strong a Ribbed Wall™ tank is, it's time to discover if you can store liquid in them over winter. This has been a huge concern in the past so I would encourage you read the article below. I really enjoy teaching people about topics that I am passionate about. Sign up to our blog to learn the best answers to popular questions about Liquid Storage & Transport!